Adaptimmune has a multi-year strategic alliance with The University of Texas MD Anderson Cancer Center (www.mdanderson.org) signed in 2016 designed to expedite the development of novel adoptive T-cell therapies for multiple types of cancer. This alliance utilises expertise from clinical and translation sciences teams across the two organisations. MD Anderson is an important partner for Adaptimmune, both for its role as a leading US cancer center in treating patients and its translational science expertise. "We believe that this strategic alliance provides a strong partnership to facilitate and support Adaptimmune's development of multiple first and subsequent generation SPEAR T-cell therapies against many intractable solid tumors in our clinical programs. It will also generate invaluable data from patient samples that will help us understand these therapies and enable us to design the next generation of studies. We are very proud to have this alliance with the outstanding team of cancer immunologists at MD Anderson, and are confident that together we will continue to move these novel immunotherapeutic candidates forward for patients who are fighting a variety of cancers." MD Anderson is acknowledged as a key hub for development of cell therapies - with immunotherapy being a particular focus. The collaboration between Adaptimmune and MD Anderson across the translational science area is accelerating our understanding of existing programmes, such as ADP-A2M4 (MAGE-A4) and ADP-A2M10 (MAGE-A10), as well as playing a key role in Adaptimmune's ongoing research and development of other new SPEAR T-cell therapies to targets in a wide range of solid tumours. The partnership also enables access to tumor samples which assist in the validation of new targets and ultimately informs clinical trial design, while its cancer immunology core skills and expertise in performing translational medicine studies informs Adaptimmune's optimization of the efficacy and safety of SPEAR T-cell therapies. "It is our hope this alliance will allow us to address numerous solid tumors and augment the patient's immune system, directing it against tumors based on their specific molecular makeup." Since 2016, we have worked together on multiple projects. We have just reported findings from one of our initial projects, at AACR 2018. Here is a link to the poster: http://aacr18.posterview.com/nosl/i/2562. While ADP-A2M4 (MAGE-A4) expression in tumour types can be estimated from published databases, it is vital to complement this with analysis of actual tumour samples. A recent example of the excellent collaboration between Adaptimmune and MD Anderson is the work carried out to determine the frequency of ADP-A2M4 (MAGE-A4) expression in non-small cell lung cancer (NSCLC), further informing Adaptimmune's screening strategies in this key indication. 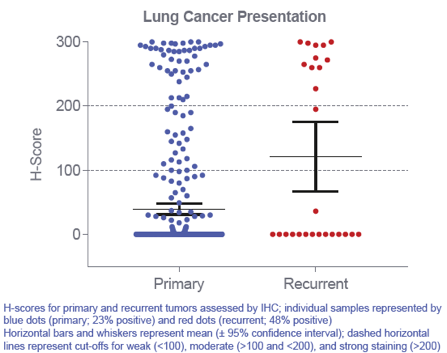 A total of 534 resected NSCLC cases (stage I - IV) were selected from the MD Anderson tumour repository. These samples came with associated clinical pathology information including overall survival and recurrence, and were analysed for ADP-A2M4 (MAGE-A4) expression. 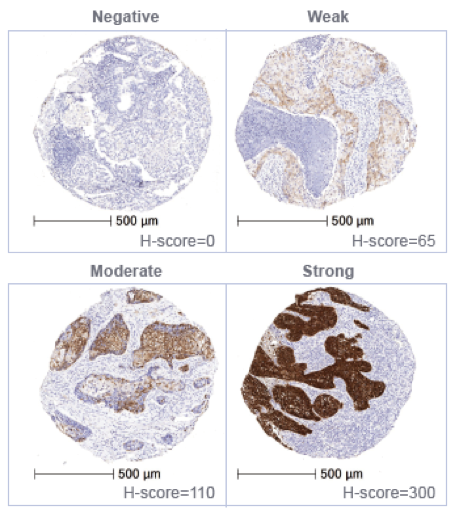 Expression analysis was carried out using immunohistochemistry, with the tumour samples stained and scored by MD Anderson scientists and pathologists. The data was analysed by translational scientists at Adaptimmune. IHC staining of tissue microarray samples, showing negative, weak, moderate and high levels of staining for ADP-A2M4 (MAGE-A4). A higher frequency of ADP-A2M4 (MAGE-A4) was observed in squamous cell carcinoma (SCC) than adenocarcinoma, with 30% of SCC cases having strong ADP-A2M4 (MAGE-A4) staining compared to only 2% of adenocarcinoma cases. In addition, ADP-A2M4 (MAGE-A4) was seen to be expressed in both primary and recurrent NSCLC indicating that MAGE-A4 is a promising target in both of these situations. A clinical trial opened in 2017 to treat patients with inoperable or metastatic NSCLC (SCC, adenosquamous, or large cell carcinoma); ovarian cancer; head and neck SCC; gastric or esophageal cancer (SCC or adenocarcinoma); urothelial tumours; and melanoma (NCT03132922). Work is ongoing in collaboration with MD Anderson to evaluate the expression of ADP-A2M4 (MAGE-A4) in samples from the MD Anderson tumor repository, and will be used to further improve the identification of patients who can benefit the most from ADP-A2M4 (MAGE-A4) SPEAR T-cell therapy.